Irish writer Angela Nagle has gone to the dark side of the Internet to research Kill All Normies: Online Culture Wars from 4chan adn Tumblr to Trump and the Alt-Right, delving into toxic online cultures and websites of the conservative misogyny and racism. I can't imagine what spending what spending a lot of time in the /b/ section of 4chan, looking at "things you can't unsee" could do to anyone's pysche, but Nagle did it, and wrote a series of articles for, among other places, The Baffler, in which she comes to the conclusion that Trump's victory is, at least in part, due to the 'alt-right', and therefore the Right, winning the culture wars. Her theory is based around the idea of transgression, the over-steeping of societal mores or morality for sexual pleasure, and/or to rebel against authority, and/or for the simple pleasure of irreverence for its own sake (or the 'lulz'). Since maybe the Marquis de Sade up to the 1960s, Nagle claims that transgression has been the domain of liberals, but that starting in the 90s, liberal concern with political correctness and identity politics (rather than actual politics), conservatives have moved into the role of the transgressors online. The problem, according to Nagle, is that this, or rather these (and she goes into various of them and how they sometimes don't get along) subcultures have not only ended up influencing the mainstream conservatives, like the conservative website like Breitbart, run by Steve Bannon, who went on to support and advise Trump for a while, but that they're (liberals) are making conservatives look like the voice of reason to regular people, or at least Trump voters. My favorite 'chapter', which originally was an essay, "From Tumblr to the campus wars: creating scarcity in an online economy of virtue" in which she skewers identitarians, sometimes simply by quoting, at length, some of their ideas about gender choice, and reminding readers how some of those demanding respect and the right not to be 'triggered' are the very same who shout down free speech and even physically attack those who think differently. I'm with Nagle, I share her progressive politics and her disdain for the so-called liberal identity politics and its disdain of free speech, its disinterest in, say, our country's economic policies, and, say, that the Democratic Party's foreign policy isn't much different from Republican foreign policy, i.e. we're invading other countries with impunity and killing people. 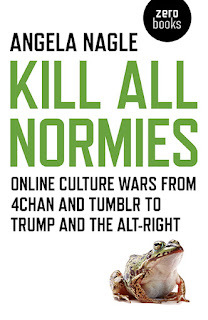 But Kill All Normies is just not, unfortunately, a good book. Kill All Normies is short, 120 pages, making it more like a pamphlet, and collects essays by Nagle, some of which appeared at The Baffler (and which you can find for free online if you want). I had thought that the book would expand on those esssays, but no. They're in slightly different form, but not much. And, while they touch on interesting ideas, and introduce us to interesting-if-horrifying people involved in the alt-right movement, they, and the book, read more like what in graduate school is called a 'lit review,' which is the first stage of writing a longer thesis, in which you summarize a source in a paragraph or two, collect these summaries in one document, with the idea of expanding on the sources later, of adding more, especially of one's own ideas and thoughts. Instead, in Kill All Normies, all of the chapter/essays paragraphs and ideas go by quickly, sometimes (many times) with no real context or connection to the paragraphs around them. I'd quote a paragraph here, except it would only appear as it appears in the book, without much context. In addition, Nagle doesn't seem to care about citation too much. Quotes and summaries and even unique ideas are used and, while she will give a person's name, she often will not tell us who that person is, or why they're an expert, or even which text of theirs she's quoting from. Nor is there any kind of Works Cited or References page, nor even an index. Plus, when she's talking about a text, she annoyingly uses the past tense rather than the traditional present tense (unless they do that in Ireland?) Which is partly on her, though also partly on her publisher, Zer0 Books, which claims to want its books to be "intellectual without being academic." That's fine, but not having some kind of way for readers to check sources is intellectual sloppiness. In addition, Nagle seems not to understand certain texts and writers except through the lens of alt-righters, nor even to have even read those texts. For example, she states more than once that the animated tv show South Park is conservative, maybe picking up on a Time review a few years back that claimed the same thing, but it's not, it's just irreverent: the writers of South Park with make fun of everybody, conservative or liberal. Nagle could use that in her argument that the alt-right has co-opted the use of irreverence, and therefore anything irreverent nowadays is concervative, but she doesn't. Also up for critique by Nagle, slightly, kind of, are the philosopher Nietsche and the book Fight Club by Chuck Palahniuk (though I swear she never actually cites his name in talking about it). Her argument being, because again I don't think she's read them, that if/when the alt-righters quote from them and/or espouse an anti-mainstream/anti-the-masses attitude, doing so must means that those texts must be conservative, when an anti-mainstream philosphy/attitude is shared by those on the far Left, like me, and, I thought, her. And if I'm wrong about that, well, this is where Kill All Normies would have benefitted by a more detailed, and longer, analysis. Is Kill All Normies still worth reading? Yes, even if as a sort of lit review of sorts, as a way to explore this huge topic (or, topics), though you'll have to do your own research to find some of the texts and people she talks about. Nagle's main idea, discussed above, is important: conservatives are winning the culture wars, and those who control culture control politics. She offers no solutions, but you'll get a glimpse into at least some of the reasons how and why Trump won (Hint: it's not Russia).